Tired of paying extra money per account? Stop doing that!!! Presenting to you the most affordable scheduling tool to manage unlimited social media accounts. Schedule your social media posts ahead of time without burning a hole in the pockets. Buy Now! Let's Have A Look At The Demo Of Social Aider Scheduling Tool! What Exactly You Will Get In This Scheduling Tool? All the features that you can utilize are the same for both, the personal and professional plans. The only difference between the two is that you get more post-credits in the latter. Why Choose Social Aider As Your Scheduling Tool? Whether you are struggling to manage your own social media accounts or handling the social media of multiple clients, Social Aider will make your life easy. It has been designed to save your time and efforts. With Social Aider you get tools to manage all your social profiles and schedule content at your convenience. It’s your personal Aider, waiting to assist you in all your Social Media Automation efforts. Leave the mundane to it so that you can concentrate on bigger things. Not 1, not 10, not 100, it is UNLIMITED! You can add unlimited Social Media profiles to Social Aider. So, if you are a Social Media Specialist or an Agency with multiple clients, we’ve got you covered! Just one tool to all your social media scheduling aid! The costing of this scheduling tool does not vary by the number of accounts you add. You can add unlimited projects to Social Aider! If you have 1 set of personal social media accounts and another set of professional accounts; go on and create 2 different projects to manage them all smoothly. If you are an agency with 10 or even 1000 clients, you can add a project for each client. It's costing does not change by the number of projects you add. 3. Select any plan, there is no limit in accessing features. With Social Aider you get to manage all of your social media accounts all from one single dashboard. Eliminating the need for you to login to every single media platform for posting/sharing your content. Just add your content via our dashboard, select the media you want to post them on, and leave the rest to it. Use your time saved to create more awesome content! Leverage the power of scheduling. Do you post at the same time at all social media’s? If you don’t then you know the pain of tracking the time and logging into each media to share your content on it at the most appropriate time. Social Aider offers you the scheduling option. You can choose the time, down to minutes when you want each piece of your content to be posted on each media. Just Set it and forget it. When the time is right, it will make sure your post goes Live! You get to schedule up to 50 posts daily for sharing! Use your time saved to design some more crafty Social Media Strategies! Got all the content you want to share for the entire month lined up? Great! Upload it all onto our dashboard and you are free for the entire month! With the Calendar Scheduling option of Social Aider, you can choose which day you would like which piece of content to be shared on which media! And the best part, once you have it all scheduled up you can view it in a clean calendar format, so you know which content is going live on which media when. If you want to share an important article on Facebook on Sunday, but on LinkedIn on Monday it got you covered. Its Calendar will keep track and make sure your posts are done on schedule. Your scheduling queue can contain up to 1000 posts at a time. With your time saved take a break from Social Media, go take a vacation! If something goes wrong, and one of your posts cannot make it to the intended media, it sends you real-time alerts via Email, and Push notification ( if you chose to activate) thus ensuring you can help it to rectify the error ASAP and it can make your post reach its intended destination. Social Aider allows you to also curate awesome content with its AI features like Discover Content, Image Editor, etc. Discover new content for your social accounts with Discover Content and schedule it instantly! To discover new content using Social Aider, you’ve just got to use the right keyword. The top latest content will appear for you to schedule or post right away. Bring your photos up a notch using the Image Editor. Use the Image Editor to edit the images and create an awesome first impression of your content for your readers. Get relevant hashtags suggestions while creating posts so your content is easily accessible on the web. Add the most relevant hashtags to your posts without having to think about it. Use Suggest Hashtags to get going! 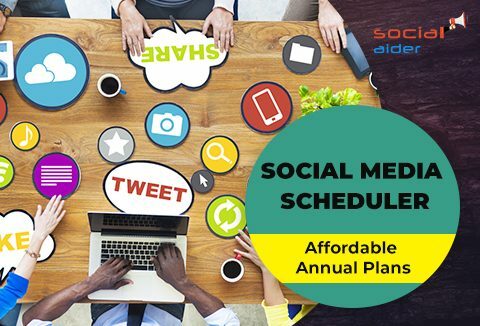 With these premium features available at such affordable prices, take advantage of the discounts on the yearly plans of Social Aider now! If you wish to upgrade your plan from Personal to Professional (or vice versa) you can do so once your assigned post-credits are utilized. What Are Customers Saying About Social Aider? The Deal is valid only if you buy a yearly plan (either Personal or Professional) of Social Aider. All the features, etc. that you can utilize are the same for both, the personal and professional plans. The only difference between the two is that you get more post-credits in the latter. Enhance your online presence with this amazing social media scheduling tool! At A Price Starting From $40 Annually! DealClub Member??? Get It From $30 Only!